coconut milk pulao recipe | veg pulao recipe with coconut milk with detailed photo and video recipe. 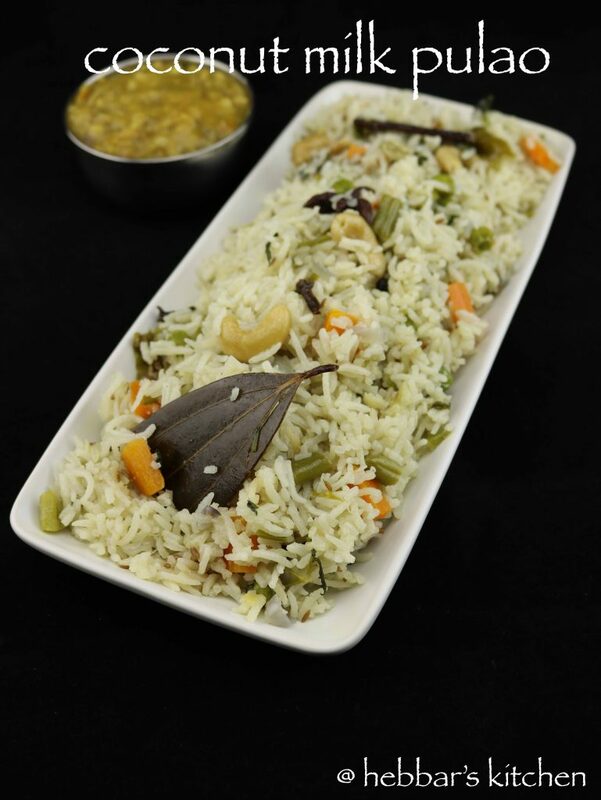 veg pulao is cooked and prepared with yummy coconut milk. coconut milk pulao recipe | veg pulao recipe with coconut milk with step by step photo and video recipe. 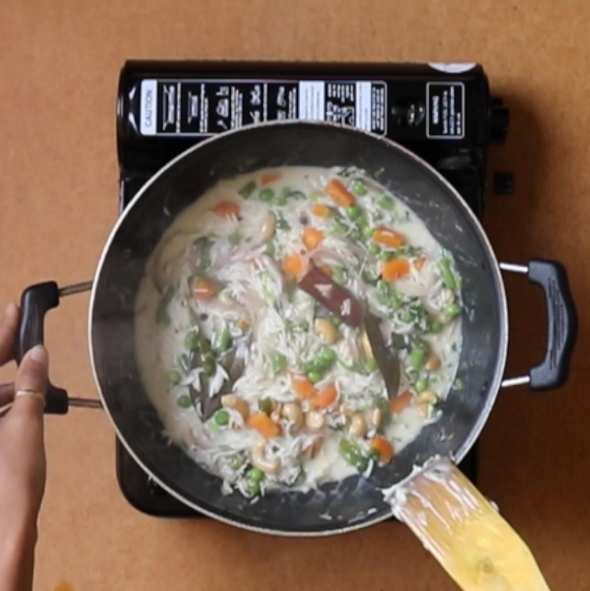 basically, coconut milk is used to cook and boil the vegetables in this yummy pulao. 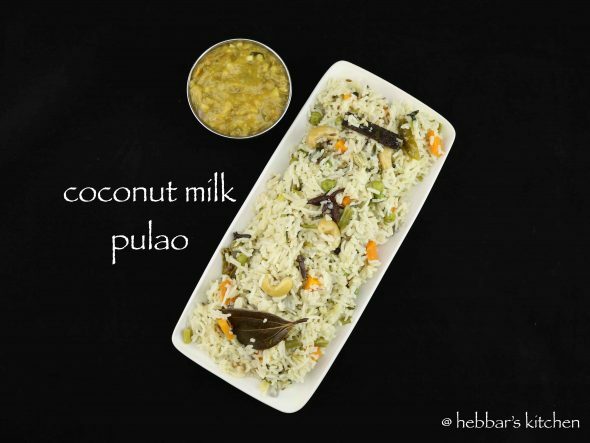 while traditional pulav are cooked with water, coconut milk gives a different angle to this simple pulao. this recipe is loosely based on the thai rice recipe which is based on coconut milk with some indian spices. i prepare veg pulao with coconut milk quite often for my husband’s lunch box. probably, the main reason is because it is very easy to prepare on busy mornings. moreover, it is favorite rice recipe too and according to him even his office colleagues enjoy this tummy rice recipe. furthermore, i even add some finely chopped mint leaves as a garnish which will make sure to deliver its aroma and taste. in addition to the yummy taste, coconut milk pulao has several health benefits due to the use of coconut milk. while many people believe that coconut milk increases the cholesterol level, however according to the study they do the opposite. the saturated fatty acids help to reduce the blood pressure and cholesterol to improve the heart health. furthermore, it improves the digestion and also helps during constipation. finally, if you do like rice recipe’s please do visit my other rice recipes, especially, puliyogare, capsicum rice, tomato rice, pudina pulao, mushroom pulao, sambar rice, coriander rice, lemon rice, bisi bele bath, pudina pulao, tomato rice recipes. 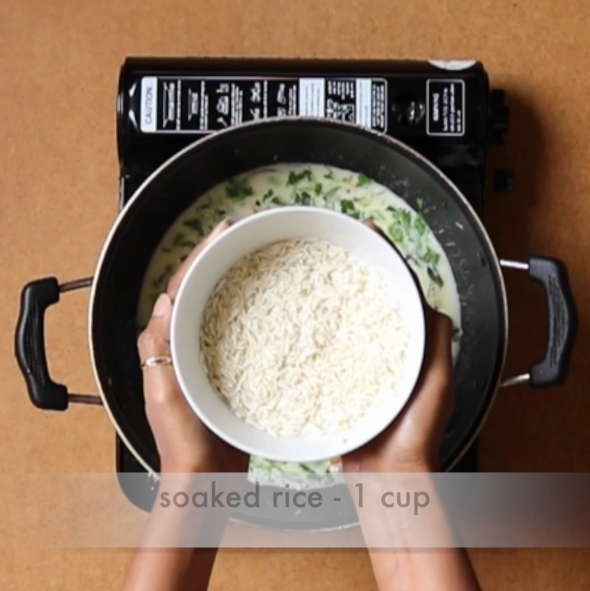 firstly, soak and rise rice for 20 minutes and keep aside. then, heat 2 tsp of ghee in a kadai and add cumin seeds, pepper, cinnamon, cloves, star, cardamom, bay leaf. saute the spices till they become fragrant. 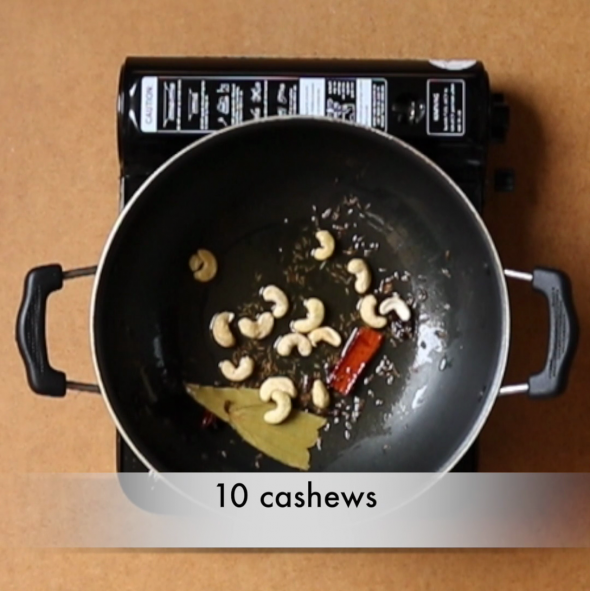 in addition, add 10 to 12 cashews. now add 1 cup thinly sliced onions and 5 to 6 curry leaves. 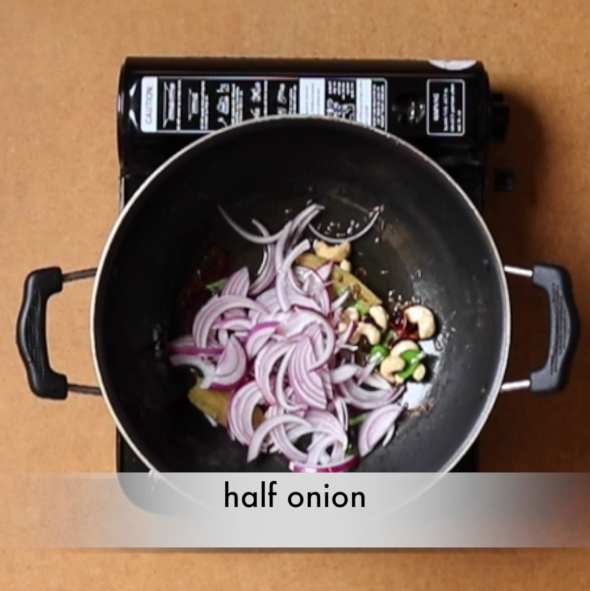 saute till the onions turn translucent or a light golden. 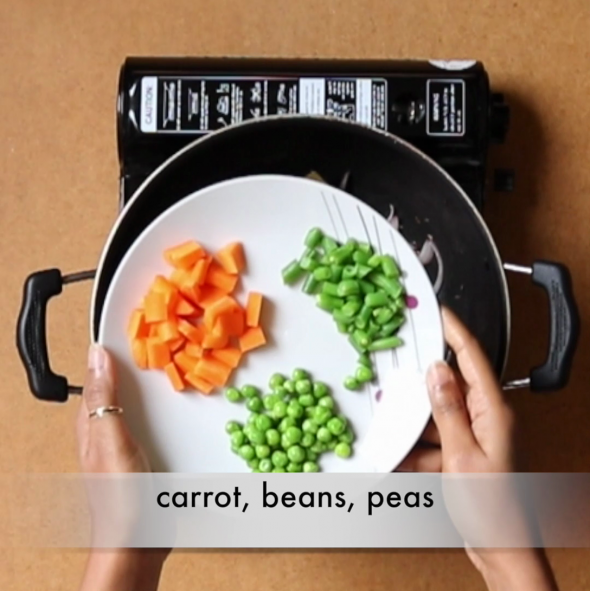 now add chopped mixed veggies of your choice. stir and saute the veggies for a minute. then add ginger garlic paste. 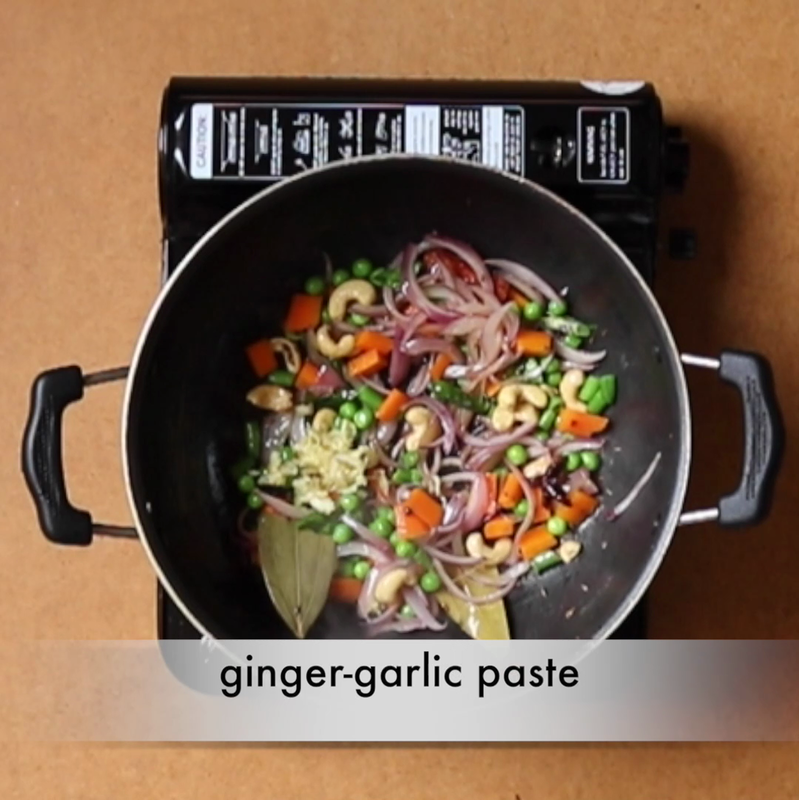 stir and saute till the raw aroma of ginger and garlic goes away. now pour 2 cup thick coconut milk. furthermore, add soaked rice grains and gently mix and stir the rice grains with the rest of the ingredients. it is now time to add salt. then, cover and cook for 15 minutes on low flame. open the lid and gently fluff the pulao. finally, serve hot with curry of your choice. in addition, add 10 to 12 cashews. cashews are optional and you can skip them. stir again. 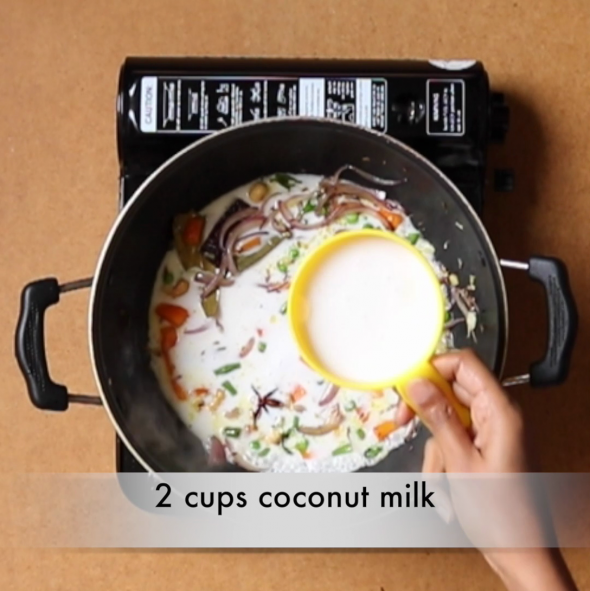 now pour 2 cup thick coconut milk. 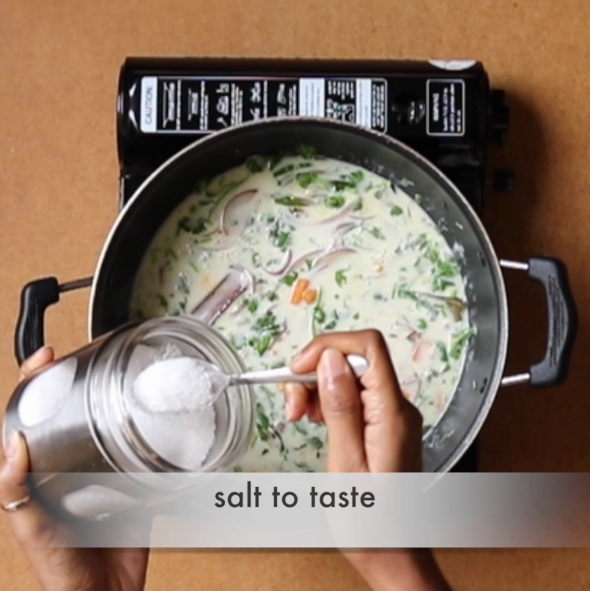 you can also add 1 cup thick coconut milk and 1 cup water and get to a boil. then add chopped coriander leaves and mix well. also add salt. then, cover and cook for 15 minutes on low flame. now, open the lid and gently fluff the pulao. firstly, you can skip the veggies if you do not like to. moreover, instead of ghee you can also use coconut oil. 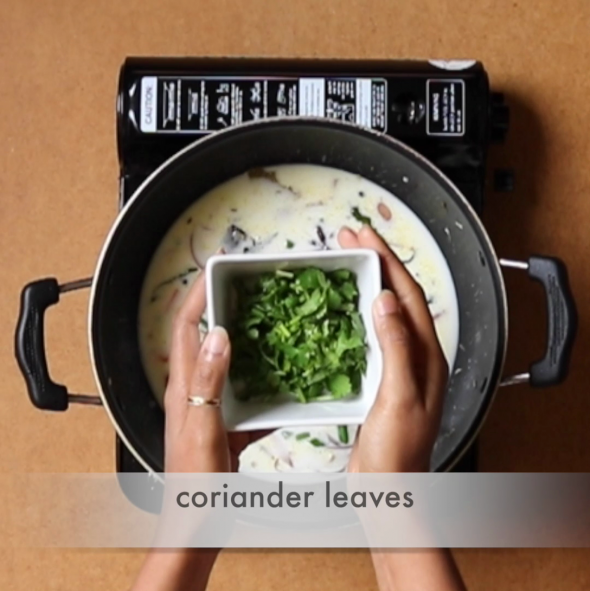 furthermore, you can also add mint / pudina leaves instead of coriander leaves. moreover, if you prefer to be more spicy, then add 1 green chilli. Hi very nice recipie. Instead of putting Coriander leaves along with Rice, I made paste of green chilli, Gingergarlic,coriander & mint leaves. Hi, Firstly i should congratulate you guys for your awesome work. I am a big fan of our site. All your dishes are very good i have tried many and it came out very well. 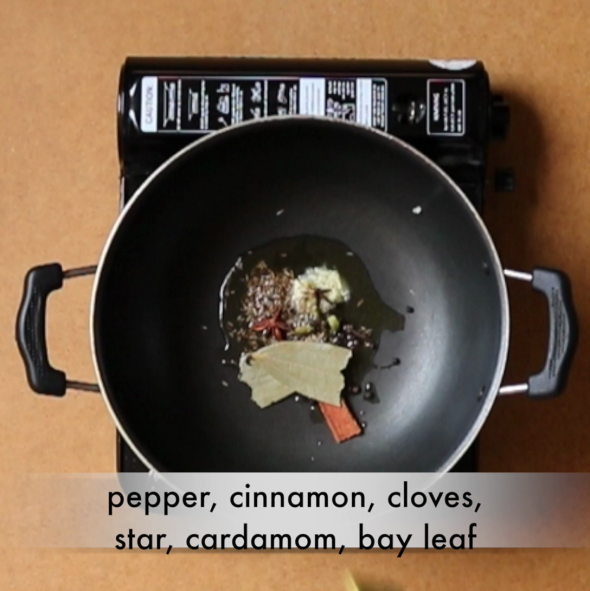 The best part is taking videos of your cooking it really helps us a lot. Please continue your good work. thanks a lot nagashree for such nice and motivating words. I really appreciate it. I have already recommended the site to many of my frends n cousins! 🙂 wishing u the best! I wud suggest u to add sme mre healthy recipes with regard to particular lifestyle related ailments if possible..u may need to consult a medical nutritionist for the same. Just a suggestion..ignore if irrelavent.. Prepared ur coconut milk pulao..it tasted yumm…! Congratulations on the wonderfu job tht u r doing..the recipes r very simple to follow for smeone who is new to the kitchen too …ur efforts need to b highly appreciated!Apt videos and pics of each recipe make ur site very special and unique..! Great job! Tried u r coconut milk veg puloa it’s very delicious. Your recipes are very good and easy to follow .thanks. Thanks a lot Sowmya for those nice words.